Fights out of Heathrow were being delayed as a consequence of French industrial action timed to coincide with the National Assembly debate on pension reform. Our jet finally landed at Charles De Gaulle with less than 10 minutes to go before the scheduled departure of the connecting flight to Tokyo. Air stewards’ reassurances that the connection would be held spurred me to navigate the labyrinth of security as quickly as I could (dumping the ever-suspect containers of liquids, pastes and gels rather than laboriously transferring them into yet another plastic bag) and to sprint, straining and sweating, first to the monorail and then, much slower now, down the carpeted corridor that lead its long, straight way to the designated gate. Being overtaken by two fitter travellers familiar from the Heathrow flight offered a sense, at least, that others had decided the connection was still worth trying for and, as the passing gate numbers steadily climbed towards 65, I began to think it possible. Slowing into the arrangements of chairs, counters and signage that made up Gate 65 revealed an empty lounge, its emptiness sharpened by a cleaner uncoiling the cable for her hoover, and the two faster sprinters brandishing passports and boarding passes as props in their remonstrations with the desk staff. The stubborn solidity of the still present and motionless plane, visible some 20 metres away, seemed particularly vindictive. And so I found myself with 11 unexpected hours; each one of which had to be spent in a strangely tranquil hinterland beyond both Arrivals and Departures, isolated from the world outside by two separate security checks. After fury unwound to frustration and then tightened up into panic until that, too, loosened into resignation, there was little left to do than to watch this part of the airport at work. Previously only ever seen from the glancing vantage afforded when rushing through to a gate and, occasionally, from the static perspective of a crowded room of disgruntled and delayed travellers (who themselves – rather than their surroundings – provided ample focus) I was now able, to some extent, to view the underpopulated space for what it was; to catch at least a glimpse behind the institutional curtain. To observe the cleaning routines that journeyed from the East of the 500 metre corridor down to its West; to notice how very few staff occupied each shop and to watch their shift patterns change as afternoon turned to evening and then to night; to see how this gate was connected out to other spaces, spaces of surveillance, transport and supply; to hear that the PA systems never quite settled down to silence but fizzed and crackled and popped, like ears adjusting to pressure change, to realise how frequently those PAs repeated the same messages, again and again and again, and to appreciate how the combination of building materials and the control of the volume and position of the various speakers conspired to minimise acoustic overlap. Much of what I was seeing and hearing was both a regulated and regular environment assembled out of repeated architectural sequences and might well have been found within Marc Augé’s influential cartography of the non-places of supermodernity. These locations, Augé argued, were to be discovered “driving down the motorway, wandering through the supermarket or sitting in an airport waiting lounge waiting for the next flight to London or Marseille … In the concrete reality of today’s world, places and spaces, places and non-places intertwine and tangle together. The possibility of non-place is never absent from any place. Place becomes a refuge to the habitué of non-place (who may dream, for example, of owning a second home rooted in the depths of the countryside)” (1). But although some of what was here in Charles De Gaulle had an apparent inter-changeability in keeping with the ‘everywhere and nowhere’ notion of Augé’s non-place, with the expanse of time at my disposal, with the slow speed that tiredness provided and with the lack of travellers on the move, actually this space was distinguishably local. The accent was not just the vocal one possessed by those whose jobs it was to remain here for a working day, nor was it the provincial flavours of the goods on sale, or even the graphic dialect of the signage and the visible foliage that directed us to distinct geographies. It was more the sensation that every non-place, such as this Gate 65, is, through a quick reversal of perspective, someone else’s place, invested with peculiarity and particularity (their work, where they missed their flight to Japan, where they heard they had lost their job, where they remember feeling proudest of their daughter). 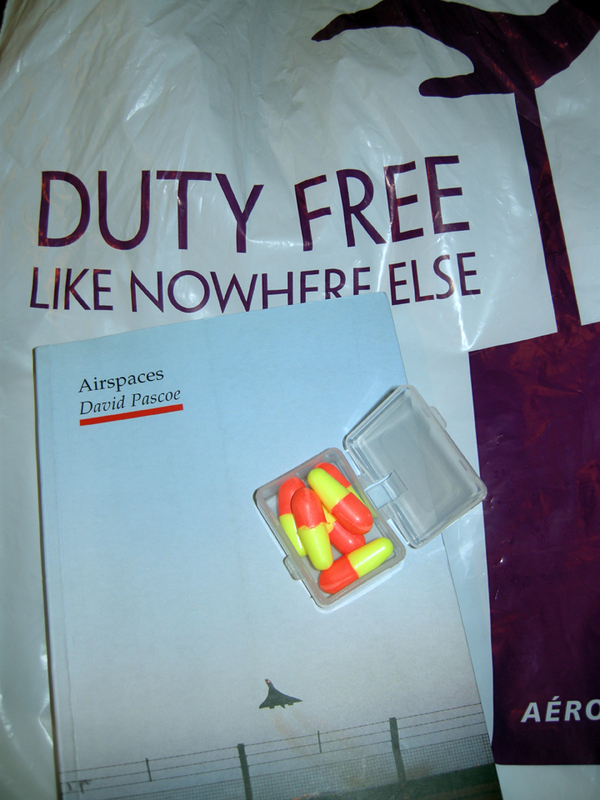 When I eventually arrived in Japan, some 29 hours after leaving home, Rupert lent me David Pascoe’s “Airspaces.” Trying to find an image for this post, I thought that photographing the cover of Pascoe’s book might be a coy way in. To give it a Charles De Gaulle Gate 65 accent of place, I thought I’d use my duty free bag as a backdrop. It was only when I was uploading that image to this blog that I noticed the caption, “Like Nowhere Else”. (1) Marc Augé, “Non-Places: Introduction to an Anthropology of Supermodernity”, London and New York: Verso, 1995, p. 107.